The stamp dedicated to winter season was issued on the 9th of February, 2016. It depicts the joyful scene of children playing with snow and making a snowman. 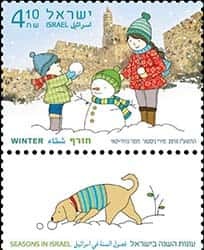 On the bottom of the stamp there is a dog in sweater which is happy to see snow. It smells it and tries to understand what snow is. The view of Jerusalem is on the background of the picture. The sheet contains 15 stamps. The cover is designed in cheerful manner too. Leafless tree and flying on the wind umbrella under the rain are drawn here. As well there is a snail, a bird and some flowers on the ground. The theme attracts attention and cheers up. The Earth completes a full cycle around the Sun during one year. A year is divided into twelve months or 365 days in nowadays calendars. Ancient calendars were used for timekeeping as well, but in very different ways. 4 different seasons make up a year. It is accepted in most number of countries that year starts in winter. The spring follows the winter, the summer follows the spring and the autumn follows the summer. And it is endless process. Each season has its peculiarities (weather, temperature, the presence or absence of some animals, plants). But not just nature shows the distinctions between seasons. People have their traditions, songs and holidays intrinsic for each season. Autumn and spring in Israel are short. They often bring quick and unexpected changes of weather. Of cause, the coldest season in Israel is winter. But it is "the coldest" for Israel, because December may meet you with exhausting heat as well as with the 0 °С and snow. People always wait for winter rains because they fill even dry riverbeds. Due to rains and average temperature 13-20 °С landscapes of Israel turns bright green, citrus fruit appear in the orchards. Snow falls mostly in the central parts of the country (and melts quickly here) or on the mountain peaks. Despite of wet and rainy weather people like winter as it feed the land and new green, flowers, fruits grow. As well there are many warm days in Israeli winter.